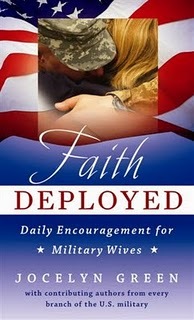 I had responded a few weeks ago for a chance to review a book called “Faith Deployed, Daily encouragement for Military Wives” by Jocelyn Green ,and had been eagerly awaiting the arrival of my book since I got a response that It was on its way. I Follow the Faith Deployed’s Facebook Page, and her blog as well, and find alot of encouragement from both places. When I first found out I was going to have the chance to review this book, a voice in my head said “what are you thinking?! look at all those yet unread books on your shelf” As a Military wife, and mom of three kids, one with special needs, finding time to read without interruption is a luxury…and a rare one at that! As I sat down and opened “Faith Deployed, Daily encouragement for Military Wives” , I was instantly impressed with how easy it was to read. Each story is 2 pages, starting out with a Bible verse and ending with a Prayer. A Daily Dose of God’s Love and Truth , matched with a short story from Military life. Military life is full of “Hurry up and wait” , we have to learn to be “Semper Gumby” (Always flexible) while still balancing kids, school functions, jobs, housework, and life in general. Thankfully we have a solid rock to stand on when our faith rests in Jesus. This Book is a refreshing reminder that we are NOT alone, and is presented in a way that is manageable to read, a true daily dose, with questions to think on through the day, and a prayer to go with each segment. If you get nothing else from what I have said here, read this….If you are a Military wife, I HIGHLY encourage you to get this book!! If you are a Civilian searching for that perfect gift for a Military friend….This is IT!!! The book’s Web site, www.faithdeployed.com, won third place in the blog category this year from the Evangelical Press Association, too.